CHINATOWN — Daniel Burnham proposed it. Engineers and laborers moved the Chicago River to make room for it. But more than a century passed before construction got started on a road connecting Chinatown and Downtown. 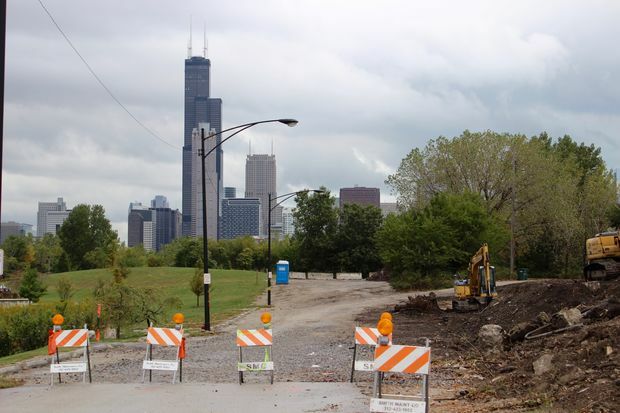 Work began this week on the long-promised Wells-Wentworth Connector, according to city officials and Ald. Danny Solis (25th). The new $62 million roadway will realign Wentworth Avenue and Cermak Road, in turn easing congestion for Chinatown and South Loop residents heading Downtown. Though modest, the project's initial phase near Wentworth and 18th Street is an important first step toward realizing the city's longtime plan to better connect the area just south of Downtown to the city's core. The work underway now includes a new traffic signal at 18th and Wentworth, new sidewalks along both sides of Wentworth, and a new buffered bicycle lane, the city's transportation department said Friday. The ambitious project traces its origins to the days of Burnham, who proposed the connector in his 1909 Plan of Chicago. City officials even rerouted the Chicago River to accommodate the road, but progress was thwarted by the Great Depression, said Dennis McClendon, an urban planner active with the South Loop Neighbors group. Mayor Rahm Emanuel resuscitated the connector in 2014, securing its funding through two tax increment financing districts. 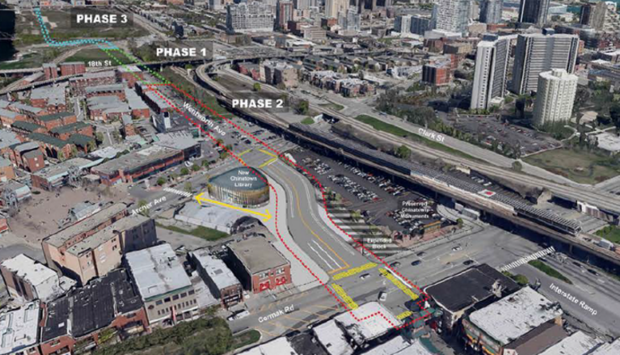 The connector would run straight through a large plot of vacant land along the river and connect Wells to Wentworth between 18th Street and Roosevelt Road. The project's second phase will realign Wentworth between Archer Avenue and Cermak Road to ease traffic congestion, according to the city. Second phase plans also call for a new plaza near Wentworth and 19th Street. Work on the second phase has also begun, city officials said Friday. The connector would be a welcome sight in the South Loop, where motorists have jammed Clark Street, Michigan Avenue and other north-south streets for decades. "Clark became — both partly by design and partly by function — an auto sewer that became quite unpleasant to walk along," McClendon said. "We have a severe lack of east-west connections in the South Loop, but it certainly doesn’t hurt to have additional north-south connection as well." The unevenly configured four-way intersection of Cermak and Wentworth is also clogged by traffic leaving the Dan Ryan Expy. and trucks bolting from a nearby firehouse. The intersection can be problematic for drivers and pedestrians, according to city officials, and often requires police to direct traffic. Chinatown leaders said the project would serve as a bridge between the current Chinatown and the original Chinatown established more than a century ago near the city's financial district. “It will bring Chinatown together,” said C.W. Chan, chairman of the Coalition for a Better Chinese American Community. Chinatown Square has been the neighborhood's main draw for tourists since it opened in 1993. Neighborhood experts say the connector will also fuse the square to Chinatown's more residential enclaves. “When completed, Wentworth will be widened, and both the original Chinatown and Chinatown Square will be connected visually,” said Sharyne Tu, executive directory of the Chinatown Chamber of Commerce. New restaurants, shops and bakeries have popped up in recent years along South Wentworth Avenue, “bringing back the vitality of yesteryear,” Tu said. The Wells-Wentworth Connector could keep that momentum going. The project will improve pedestrian access along a stretch of Wentworth near 19th Street, an oft-cramped two-way road with no sidewalks. The connector — with new sidewalks and landscaping — is expected to ease pedestrian access to the sleek field house at Ping Tom Park. McClendon hopes the city will spend more time thinking about how the connector can benefit bicyclists and pedestrians — not just cars. More questions, like where the connector would branch off east-west and how it winds through two huge development sites now slated for thousands of new homes, have not been answered. "I’d like to see not just two moving lanes in each direction," McClendon said. The first phase is expected to be done by June, with the final phase expected to begin in 2018, city officials said.